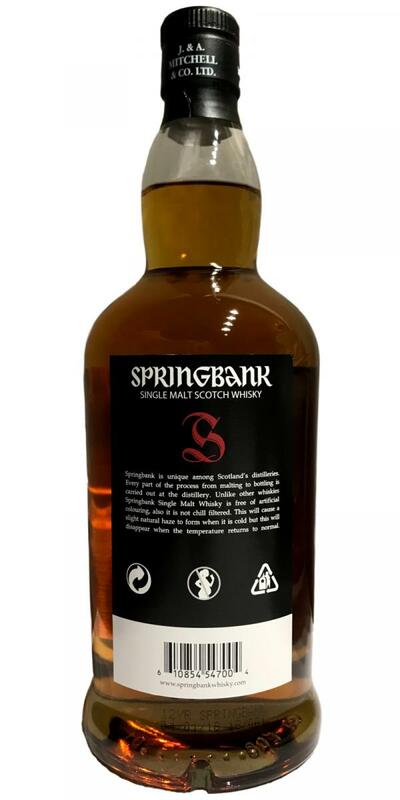 [February, 2018] So far I really enjoyed most of the cask strength releases by Springbank and this new release is bottled at exactly the same abv of 56.3% as the 2016 one that I liked best so far. 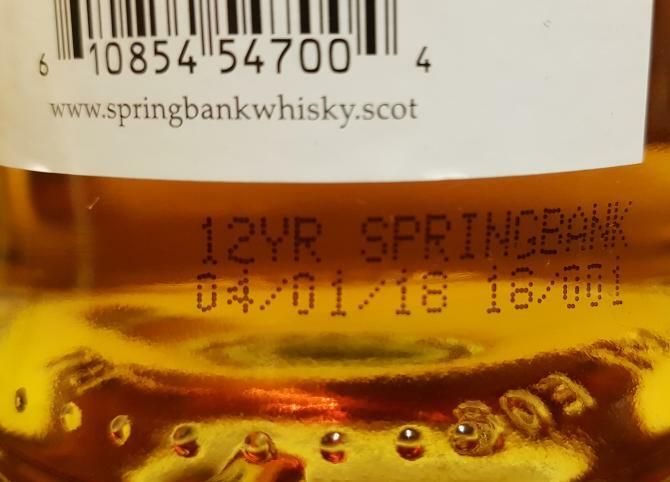 This new release was the first batch of Springbank in the new year bottled on January 4th, 2018. I bought this bottle for 54 Euro today. The colour is amber and the texture shows many small tears that slowly consolidate. The nose offers a rather unusual profile of marzipan, cheesy and meaty aromas that do not really chime together. To be frank, I do not like this. The dram arrives a little hot in the mouth with almost no coating effect at all but a minor adstringent feeling (ashes). The taste again shows this strange marzipan-cheese-meat combo that is not to my liking - but where do these flavours come from (I never had this in a Springbank CS before)? The finish is of medium length and sweeter than the taste but with a drying end (tobacco ashes). Water does not help either. PS: There is a minor sulphury note in this batch, too. In the last batch gabs still a hint of Kuhstall, here it is marzipan in the nose. Always a small feature, but always with the same basic character and the same high level. Same same but different. The lick salt is there, the dried fruits (apricots, dates), salt, vanilla ... But there is also something I have not had in any 12 CS since the 7th batch: a clear marzipan note. And she's gone again. Now damp hay (without Kuhstallgeruch), pepper, cloves, juniper berries, bay leaves, a little tree resin. Sherrysüß at the start, no trace of sulfur to make out. Quick turn into the spice, without losing the contact with the sweetness (now wildflower honey). Salt and pepper, again a lot of spices (see nose), orange peel, slightly roasted. From the marzipan note from the nose there is nothing to find on the tongue, but nougat chocolate. Becomes a bit over time. Long and dry, salt liquorice, orange peel, mild herbs. 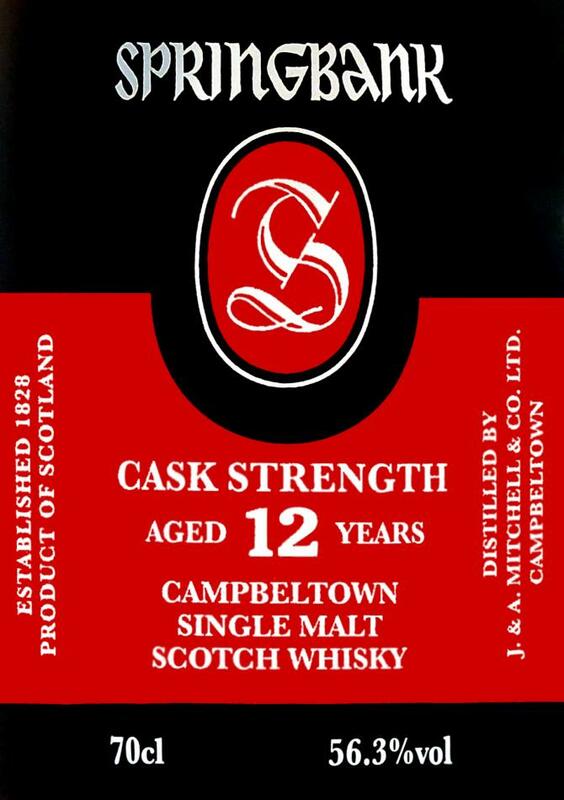 Slightly flinty nose, sweet, alcohol, sherried, smoky developing towards ashy, buttric. The big sweetness (marzipan) and Fred Flintstone are accompanying from start to finish. Not really balanced and no complexity. Actually, quite dirty. Not my favourite Springbank profile and a dissapointment as I found the new 10 quite exceptional in price/quality relation and taste. But bourbon casked Springers tend to please to please me much more in these modern times. Maybe let the bottle air for about 6 months? N: Slightly sulfured, tart raspberries, dirty ash, rubber, dry gravel, minerals. F: Still that sour salty combo. Chlorine, Red berries. A little ashy. Thoughts: Some good elements, but it’s not one I would buy again (this batch) due to the sulfur. Call me old fashioned, but I prefer the regular old 10 year. A quite lively and light expression. Fresh sherry notes on the forefront accompanied by an intense sulfur-reek. Spent matches are a primary tasting note throughout. Spirit is on the sweeter, simpler side of the springbank spectrum. H2H with batch 5 & 15. Is this batch a fluke? 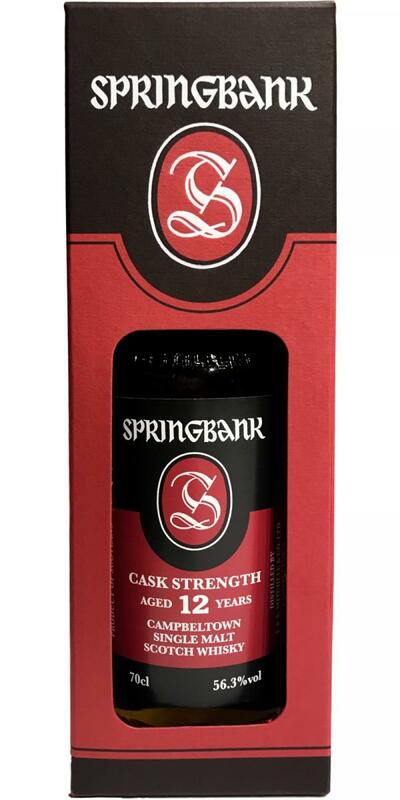 The cynical side in me suspects Springbank is now reserving good casks to age longer or driving down the 12 CS quality to prevent it from cannibalizing sales of their expensive bottlings. The nose (neat) is closed, but after some time it opens up. Cherries, marzipan, peat and ash, brie. I concur there is cheese, and while not offensive it detracts from the potential of this nose. A tad dry, somewhat astringent, and quite sharp. The sharpness was really surprising! It basically tastes as it noses except more ash, so no real development here. Medium, drying, some pepper, some chocolate, and fairly salty. 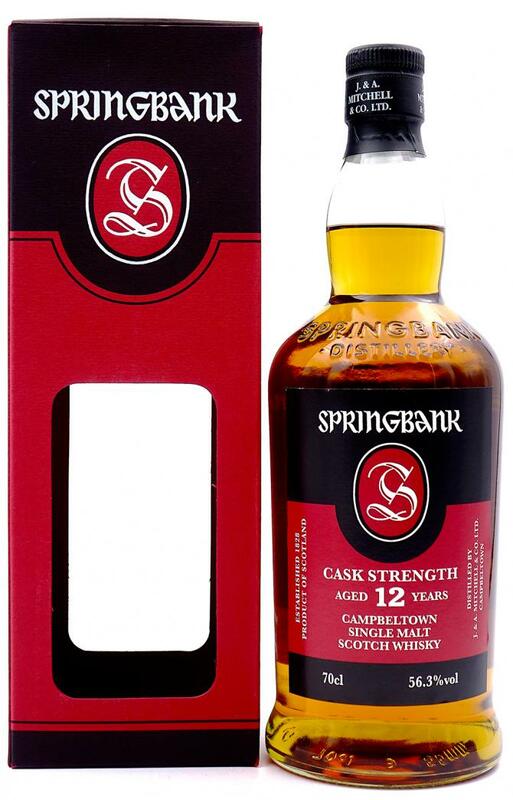 Classic meaty springbank, very aromatic nose and confectionary palate. Highly recomended! Sweet and sour nose. Rasins and pineapple, orange marmelade. Baked apples and pears, coconut, lavender, perfume. Light "cheesy" note, not unplesantly so. Roasted coffeebeans and freshly made tea. Creamy milk chocolate, and raw honey, along with potpuri. The nose is where this whisky is focused. Somewhat spicy, white pepper and nutmeg. Very creamy and full. Rich chewy cola and melted butterscotch. Cream and butter. Fruity pastries and wild strabwerries. An intense fresh and later roasted marzipan and marzipan pastries. Lingering sweetness, but still creamy. More nutmeg and wild strawberries along with grapes. Seems a bit less mature than the previous batch, but they're clearly in the same style. Both are not as sulphuric as some earlier batches. Mango, peat, caramel fudge and vanilla. Water adds apple. Ashy peat, papaya, mango, caramel and coconut. Peat, cocoa, mango and caramel. 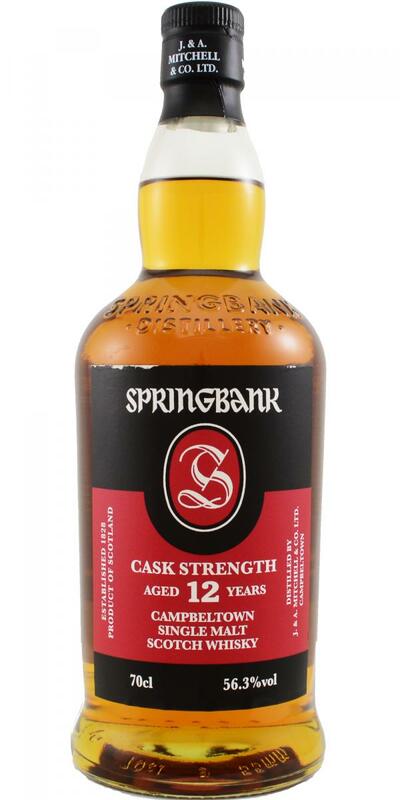 This is a typical Springbank. Old carpet in the nose, typical Springbank taste but a little dry finish. I like it!